Preferences are assumed to play a crucial role in many phenomena that are studied in learning psychology, social psychology, consumer science, emotion research, and clinical psychology. Given the pervasive impact that preferences have on behaviour, it is important to know where these likes and dislikes come from. Although some preferences are genetically determined, most stem from learning that took place during the lifetime of the individual. In this special issue, the editors focus on one such type of learning: associative learning of likes and dislikes, that is, changes in liking that are due to the pairing of stimuli. Prior studies on evaluative conditioning have shown that pairing an affectively neutral stimulus with an affectively positive or negative stimulus will change the liking of the originally neutral stimulus. The papers that are part of this special issue explore the relevance of evaluative conditioning for social psychology, provide new data about the impact of contingency awareness, attention, and extinction trials on evaluative conditioning, and examine whether pairing stimuli can also result in the transfer of non-evaluative stimulus properties. J. De Houwer, F. Baeyens, A. 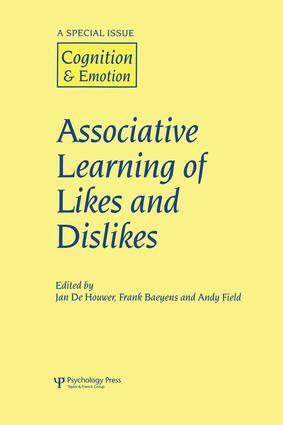 Field, Associative Learning of Likes and Dislikes: Some Current Controversies and Possible Ways Forward. E. Walther, B. Nagengast, C. Trasselli, Evaluative Conditioning in Social Psychology: Facts and Speculations. M. Hammerl, E.P. Fulcher, Reactance in Affective-evaluative Learning: Outside of Conscious Control? A.P. Field, A.C. Moore, Dissociating the Effects of Attention and Contingency Awareness on Evaluative Conditioning Effects in the Visual Paradigm. E. Diaz, G. Ruis, F. Baeyens, Resistance to Extinction of Human Evaluative Conditioning Using a Between-subjects Design. O.V. Lipp, H.M. Purkis, No Support for Dual Process Accounts of Human Affective Learning in Simple Pavlovian Conditioning. T. Meersmans, J. De Houwer, F. Baeyens, T. Randell, P. Eelen, Beyond Evaluative Conditioning: Searching for Associative Transfer of Non-evaluative Stimulus Properties.